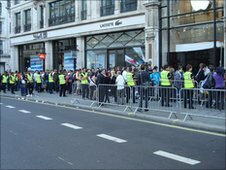 More than a thousand people have queued outside Apple's flagship London store on launch day of the iPhone 4. The phone went on sale at 0700 on 24 June and is smaller and lighter than the older 3GS version. Apple says the stainless steel body of the handset will act as an antenna and will help to improve reception of mobile signals. Some people started queuing outside the store on Regent Street 24 hours before the phone went on sale. Alex, a Canadian who lives in Dubai, flew to London especially for the launch. He told BBC News that he had become a regular at Apple events and launches. "I like meeting the people at events like this, I like meeting the people and the excitement. "In North America we suffer from locked phones, my current iPhone is locked. This is the first opportunity I've got to buy an iPhone that is unlocked," he said. The launch comes on the day that mobile operator O2 changes the way it charges for data usage. The move means the end of its "unlimited" data usage bundle. This could have implications for many iPhone users as they tend to be big consumers of mobile data. Mike Wilson from MoneySupermarket.com said it was worth shopping around for the best deal on an iPhone as different operators offered very different pricing packages. "There have been a few changes to the types of deal on offer since the 3G iPhone launched in late 2007, the biggest being data allowance," he said. Mr Wilson advised people to work out what kind of user they were and then look for a package that matches that profile. Apple has made a number of changes to the iPhone 4. The firm claims its display and larger battery gives the phone 40% more talk time; it says owners will be able to browse a 3G network for 6 hours before recharging. The built-in camera - which came in for criticism from some quarters for its poor photo quality when taken in low light - has been improved. The sensor has been enlarged, which increases the megapixel count from 3.2 to five. A small LED (light emitting diode) flash has also been included for the first time. One issue that may have to be addressed concerns the new operating system (OS). There has been considerable internet chatter over Apple's new OS, iOS 4, with numerous posts and tweets from users having serious issues after upgrading. The bulk of the problems appear to come from iPhone 3GS users, who are reporting everything from system slowdown to battery life issues. 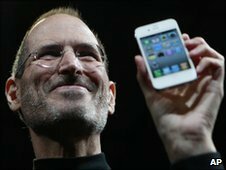 A spokesman for Apple told BBC News that they were not aware of any problems with iOS 4 and that thousands of users had installed the new OS without any trouble.